This morning I woke up with one terribly aching right lung. At first, I had forgot that swollen lung, pre-pneumonic feeling that typically extends from shoulder to abdomen to back. I, without thinking, blamed sore muscles and attempted to begin my day. Once out of bed, it was apparent that it was not muscles that were in pain, but rather that old familiar ache of lung inflammation and irritation. Without hesitation, I took my temperature and, even though realizing it was indicative of what I had thought, I denied the feeling of the sickness and put my swimsuit on. 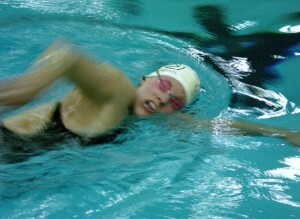 Sick or not, there was no doubt in my mind that I was going to swim and train to the best of my abilities today. This conviction must be what I keep hearing others call “drive”. I suppose that I am driven by many things, as are you, and the guy next to you, and that lady next to him. As a species we are inborn with a drive, at least to survive, but also to succeed. In terms of my swimming, I had thought that it was clear where and when that drive began. I often exclaim from rooftops about an era of my life ridden with bed rest and illness. That alone, becomes the reason that I can feel good about waking up at 3AM and training once or twice daily with a smile on my face. Obviously, without that health scare I wouldn’t be where I am today athletically. It wasn’t until last week when a new friend approached me and asked me about my drive. I went through the overly-rehearsed speech of bed rest and terror and unrealized dreams and new hope. He stopped me straight in my tracks when he confessed that he believed that my drive was far more internal than that. He went on to explain that there is something special that certain athletes possess that the rest of the world seems not to understand. I listened intently and was even partially persuaded by his appeal as I thought back to the work that I put into simply becoming well enough to learn how to push a wheelchair after breaking my back in a car accident. I thought back to the other sports that I had played and enjoyed, not letting my wheelchair hold me back from any of it. And now I think about waking with my right lung calling out to me in despair at its silent battle playing out inside of my body. I think about the fact that none of this would even allow me to consider skipping my swim or training in any way. I think about how I not only endured a long mid-day swim, but also went out on my handcycle to make sure that I was breathing deeply into those sore lungs. I think about how much swimming and my health mean to me, and how I am lucky to be driven in such a useful manner. No matter where I can give credit to the drive that I possess, I am starting to simply appreciate it for what it is and what it does for my life. Considering herself a thirty-year old know-it-nothing, Ryan has spent every single day of her life learning and absorbing light and love from those around her. A car accident created an unforeseen alternate future nearly half of her life ago. Since then, she has raced a marathon, ridden in many an Indian rickshaw, sought solace in a small creek in her backyard, tried climbing and skating and anything else that seemed improbable, stood up to the brutality of today’s youth through teaching and coaching, traveled across the country to swim, and learned to better understand her soul. To learn more about Ryan’s journey, please visit: www.ryanistryin.blogspot.com.